Hello, my name is Julian Rodrigues. I’m a Perth-based neurologist. I’ve been practising since 2005. My interest in headache began around 2010 when I began treating large numbers of patients with migraine with botulinum toxin. We know a lot about the biology of migraine now. It is a primary central nervous system disorder. People will come along having been told or believing various different theories such as it’s muscular, or it’s coming from the neck or the blood vessels or, you know, some people even think it’s some kind of sign of psychological weakness. It’s not. So when I say it’s a disorder of the brain, there is a network of activity that switches on during a migraine attack and causes a cascade of symptoms – nausea, pain, sensitivity to light, sound, etc. – and this brain network activates and then it deactivates. We can see that. It has been mapped on brain scans, so we can tell people that this is a brain disorder. The population that gets migraine is basically across the whole age spectrum. You can have your first migraine at age 10 or at age 80. Having said that, it’s more common in women, far more common, and there is a big peak in prevalence in the 30-50 age group, particularly in women. That’s clearly impacting on people at their most productive time of life. The first thing I ask people when they come with a history of migraine is take me through a typical episode. Because everyone is not necessarily exactly the same. Within a patient, the attacks are often stereotyped. They can have more than one type of headache, if you like. It’s even possible to have migraine episodes without headache at all, which then confuses people even more. So the first thing is to get a story from the person. Another crucial component is getting a headache diary. I like people to walk in with a little one-month snapshot of symptoms. This helps us actually diagnose what type of headache syndrome they have. They may have migraine, they may have tension headache, they may have an overlap of the two. Diagnosis is critical because that guides further treatment. What are the symptoms of migraine? There are many subtypes of migraine. There is classic migraine, which is throbbing, one-sided headache, and sensitivity to the environment like bright lights, sounds, smells. Any physical activity, even gentle, worsens the pains, so they are pretty much bed-bound or house-bound. They can feel nauseous ranging up to dry retching and profuse vomiting and dehydration. The definition of a migraine strictly is four hours, but these attacks can often go on for 24-48 hours longer. So that’s the migraine episode. There is another subtype called migraine with aura. I have already said that migraine is a disease of brain dysfunction. Aura means that you get neurological symptoms which we can localise to different areas of the brain. The commonest one is a visual aura. People will get flashing lights, they will get a hole in their vision. Some people lose vision altogether, so have disabling sudden visual loss. These symptoms usually precede the headache phase and they can be a useful marker for when to start treatment in some people. Other aura symptoms can include paralysis, numbness down one side of the body, inability to speak, or double vision, depending on which area of the brain is affected. In some people the aura can be as disabling as the headache. As I’ve already said, you can get people coming in with just aura symptoms which are misdiagnosed as stroke, so that’s an important thing to exclude. We always investigate people who have presented with these sudden onset neurological symptoms for the first time. We wouldn’t assume they are migraine until we have excluded any other cause. The other subtypes of migraine are based on how often people get them. With the commonest variant I’m talking about, so women in their 30s and 40s, 25% of women will have episodic migraine. It will come, it will knock you out, it will go away and you will be well in between. You can have attacks of varying intensity and severity and duration, but in general you will recover in between. The other form of migraine is called chronic migraine. That affects about 3% of the population. It can occur in people, out of the blue, without any history of migraine, or it can occur in someone with episodic migraine and we say they’ve transformed into chronic migraine. So that can occur just spontaneously, for no good reason, or triggered by psychological or physical stress, a head injury, an illness. Nonspecific infections or meningitis can trigger headaches which then go on to become chronic migraine. So there is a range of people and conditions that will lead into chronic migraine. How does chronic migraine affect quality of life? Once people are in this state of chronic migraine, which the strict definition again is a bit arbitrary – 15 days per month with a headache, eight of those days have to have features of migraine. But really it’s been shown that anything more than 12 days per month with significant headache reduces your quality of life. This amount of headache is disabling, people can’t function. They do not recover in between episodes, as opposed to episodic migraine, and the other thing that’s tricky about it is that people will have had their classic migraines in their 20s, 30s, and then in their 40s or 50s or later they’ll drift into chronic migraine, and they don’t think it’s migraine because it can be a sneaky, subtle headache. 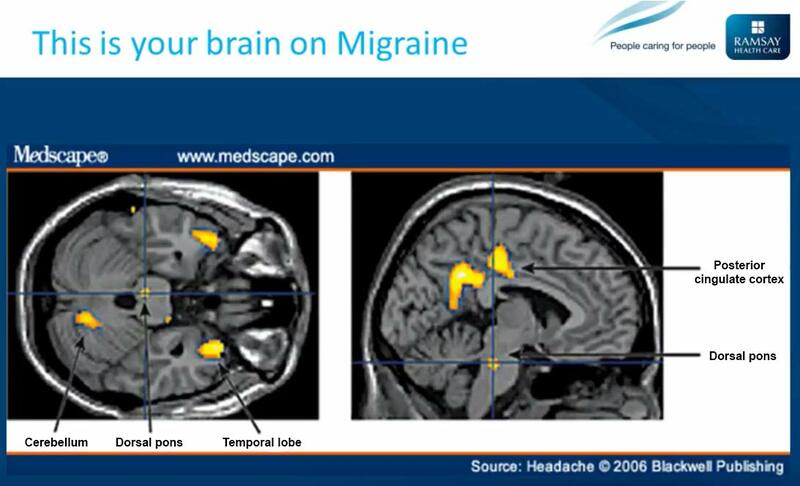 It doesn’t have to have all the features of migraine, they can have a constant low grade headache, one sided or not, and then migraine attacks in between. It often gets misdiagnosed, particularly in elderly people, as neck pain coming from joints or sinus pain and other causes, so the key thing is being diagnosed correctly. What are the triggers for migraines? Talking about triggers for migraine, there are hundreds of triggers. Looking at individuals, you can categorise them as, I guess, dietary, so certain foods, chocolates and other things, alcohol. When I’m telling people about triggers I just tell them to look out for them. The most important thing is that people don’t exclude delightful things from their life if they are not a trigger. Being didactically told that red wine or chocolate is not good for you, that’s not necessarily the case. So that’s the dietary side of things. You can enjoy a glass of alcohol without a fear of triggering a migraine in some people. Other people can’t sniff a bottle without getting one. Then there is the metabolic, hormonal type things. And in women it’s more relevant because there are more hormonal changes during a woman’s life than a man’s life. So migraine can come on early in life when periods start, they can be purely peri-menstrual. They can worsen or improve during pregnancy. If they worsen during pregnancy, that’s a problem, because we are limited with the medications we can use to treat it. And then again, when people enter peri-menopausal period, that can be a period of several years of hormonal ups and downs and migraines can be re-activated during that period of time. In general we make generalisations and we tell women and men with migraine that your migraine will improve as you get older. And that is true for most people. Then I see the people for whom that rule is broken and they’re in their 50s, 60s, 70s, still suffering from migraines, so yes, hormones definitely play a part.